Here’s a new twist on a breakfast favourite, but made entirely of creamy Belgian chocolate! 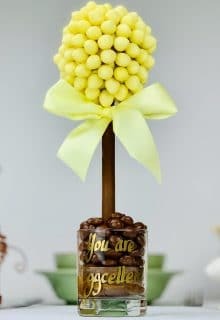 The chocolate egg sits on a milk chocolate plate, and when you ‘crack’ the egg, Jelly Belly Jelly Beans pour out! 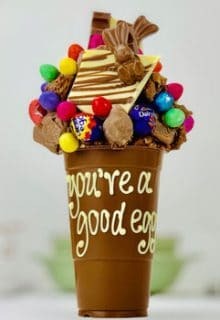 This is a different way of giving an Easter Egg, or just a gift for anyone who likes chocolate and eggs, but with a new angle. Add a name to the base to personalise for the recipient. Available with an optional wooden spoon to ‘crack’ the egg. Milk chocolate (55%): sugar whole milk powder, cocoa mass, cocoa butter, whey powder (milk), emulsifier: soya lecithin; flavouring; Milk chocolate contains cocoa solids 28% minimum, milk solids 16% minimum. Sugar, Cocoa Butter, Whole Milk Powder, Cocoa Mass. Jelly Belly Beans: Sugar, glucose syrup, modified corn starch, acidity regulators (E270, E296, E325, E330, E331, E334), flavourings, grape juice concentrate, strawberry puree, colours (E100, E150a, E153, E160a, E162, E171), fruit and plant concentrates (spirulina, apple, carrot, pumpkin, radish, purple sweet potato, hibiscus, black currant, grape), raspberry puree, blueberry puree, glazing agents (E901, E903, E904), banana puree, blackberry puree, peach puree concentrate, lemon puree, chocolate (sugar, cocoa mass, cocoa butter), passion fruit juice concentrate, orange puree, mango puree, apple juice concentrate, cocoa powder, lychee juice concentrate, pear juice concentrate, kiwi juice concentrate, watermelon juice concentrate, tangerine juice concentrate, mango juice concentrate, pomegranate juice concentrate, dried coconut powder, grapefruit juice concentrate, pineapple juice concentrate, cherry juice concentrate, salt, lime juice concentrate, freeze-dried soluble coffee, cantaloupe powder, thickener (E1400), vanilla beans, ground cinnamon. All Jelly Belly jelly beans are: Gluten Free, Gelatine Free, Dairy Free, Peanut Fee, Alcohol Free, Certified OU Kosher. Made and packaged in the same facility as peanuts, tree nuts, wheat, soy, eggs and milk products.